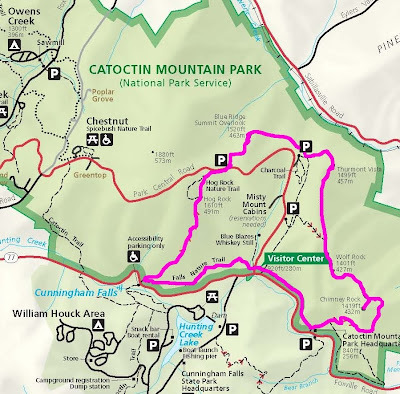 Our hiking route in Catoctin Mountain Park. This 4th of July marked the 234th anniversary of the adoption of the Declaration of Independence. In the spirit of freedom and independence, I spent the weekend partaking in as many traditional American holiday weekend festivities as I could. My partner in crime and I drove to Maryland for a 4th of July party hosted by a friend of mine and her housemates. It was the first time I'd met Patrick Gensel of in person, and as has been the case with most other Twitter folk I've met in real life, we all got along splendidly. We all spent the night talking about climbing, hiking, and playing Corn Hole, complete with trash talking and occasionally throwing the bean bags at each other. After saying our "see-you-next-times," my partner in crime and I drove to Camp Misty Mount in Catoctin Mountain Park and spent the night in one of their 4-bed cabins. The park itself is small and only 60 miles from Washington DC. We were surprised to find a number of empty cabins on a holiday weekend. I never went to overnight summer camp as a kid, but if I had, I can imagine this cabin is exactly what my accommodations might have looked like. The rectangular cabin sat on stilts built into the edge of a hill, and housed four cots with plastic covered mattresses. Modest accommodations without a doubt, but I could hardly contain my excitement when I opened the door. Our aim was to get an early start Sunday on what was supposed to be, according to trails.com, an 11 mile hike with 2200' of elevation gain. We picked up a map at the Visitors Center and set out, following the trail outlined in pink above. The park has a great, albeit small, trail system with a significant amount of flexibility. Most of the trails are unmarked, but wide and easy to follow. 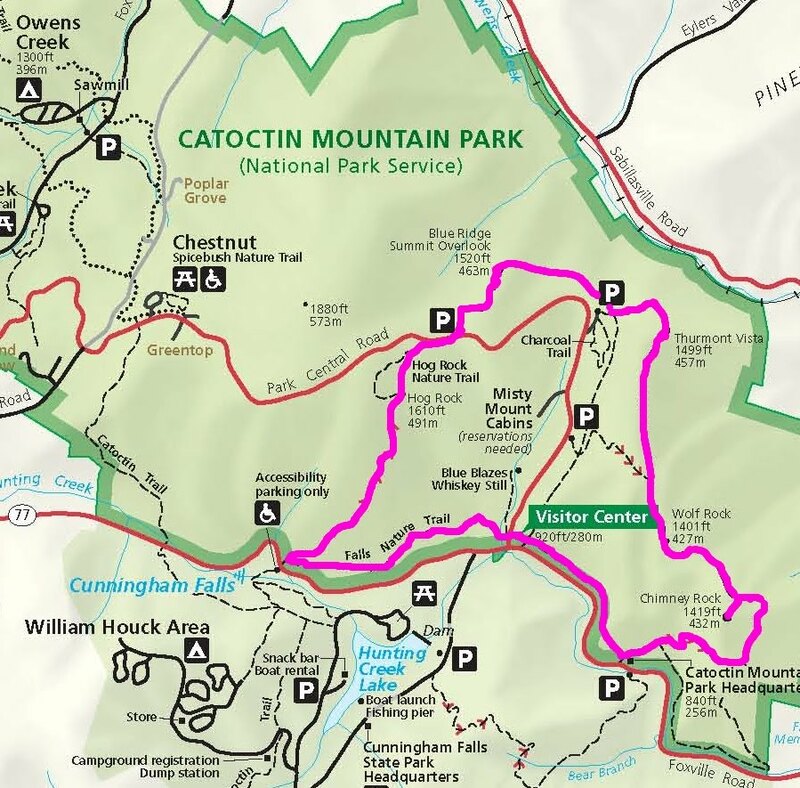 The route we took began at the Visitors Center encompassed most of what the park has to offer, including Chimney Rock, Wolf Rock, Thurmont Vista, Blue Ridge Summit Overlook, and Hog Rock. Chimney Rock provided a beautiful vista and a neat formation with giant seemingly never-ending deep crevices in the rock. We'd read that Wolf Rock was supposed to have some climbing, but nothing too significant. I wouldn't drive from Philadelphia to climb there, but the quartzite formation looked like it would've been fun to play on if we'd brought our rope. By the time we passed Blue Ridge Summit Overlook and Hog Rock, it was pretty hot out and we'd taken in as much of the views as we needed to. When we got back to the Visitors Center, we'd hiked 8 miles in 4 hours and only gained 1500'. It wasn't quite what I'd hoped for training purposes, and it seemed the only way you could achieve a gain of 2200' without looping the route would be to hike literally every trail in the park. It might not have been perfect for Rainier training, but it is a great place for a light hike, and a great place for families. My favorite part of the day was running into the family staying in the cabin next to us on the trail. They had three very young children with them, and the father led the way with the youngest, who couldn't have been more than three years old. 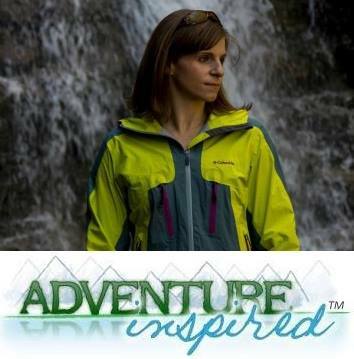 It gives me hope for future generations and their connection with nature when parents make a concerted effort to get kids on the trails, no matter their age. What are some of your favorite ways to spend a holiday weekend in the summer? Well said Katie, it was great to meet you as well. Definitely a do more often scenario. Sounds great! I love your 4th of July to-do list.